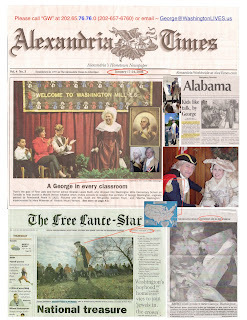 The Lady in the red coat on the left of the upper left photo is The First Lady, "Mrs. George W.", Mrs. George W. Bush, that is, Laura Bush, who on Tuesday, 15 January visited Washington Mill Elementary School, the closest school to the Mount Vernon mansion house, just a little ways outside the West Gate, in Westgate subdivision. The Lady standing is "Mrs. George W.", Mrs. George Washington, or Martha Washington, wonderfully portrayed by the wonderful lady Mary Wiseman of Potomac Avenue in the Mount Vernon magisterial district. The photo graced the front page of The Alexandria Times on Thursday, 17 January. The other photos are of "George" in front of many a classroom already... But this "George" most heartily approves of these paintings of George being proudly placed in every American classroom! 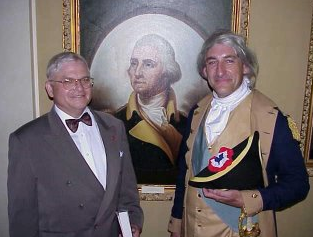 Below shows "George" beside a painting of George by a Japanese artist that was given to President Harry Truman on display at the Truman Presidential Library in Independence, Missouri. "Harry" is portrayed by Truman biographer and Living Historian, Neil Johnson, who used to work at the Truman Library. Labels: First Lady, George Washington, Laura Bush, Martha Washington, Mary Wiseman Links to this post 0 Your comments?